All about trousers! Cropped, Flared, Wide-legged, Harems and Jumpsuits. 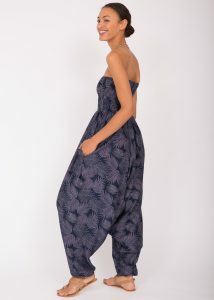 Harem trousers and “2 in 1” harem jumpsuits are the pinnacle of comfort ideal for relaxed weekends, dancing at festivals, chilling on the beach and on a yoga mat. Pair halter neck ‘cut out’ back jumpsuits with heels for a killer look or mix it up with flats or platforms to suit your mood. 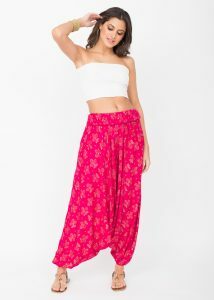 One of our favourite items this season is the cropped cotton harem pants; fresh, stylish and fun!